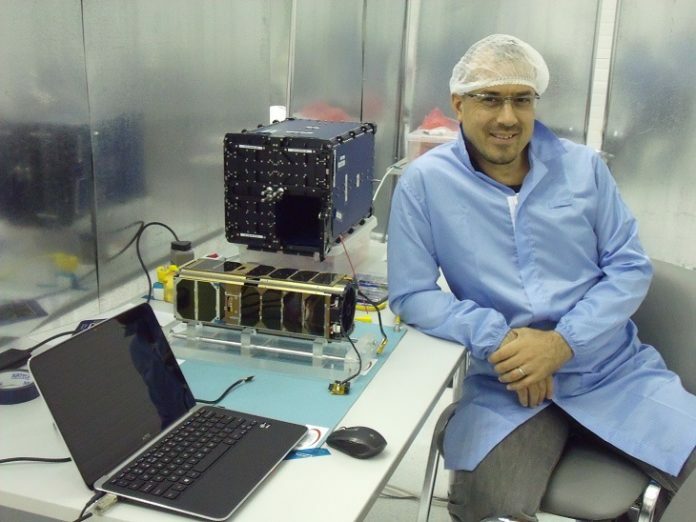 Giulio Manzoni with POPSAT. Image courtesy of Microspace. 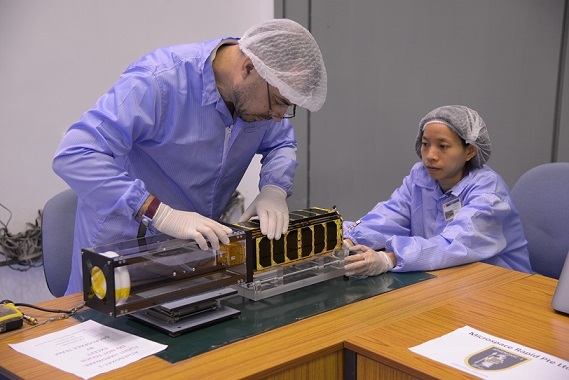 Microspace, which builds and operates its own nanosatellites, is Singapore’s first Newspace company, having set up here in 2007. The company launched its first satellite POPSAT in 2014, making history for being the first ever nanosatellite launched by a private company in Singapore. 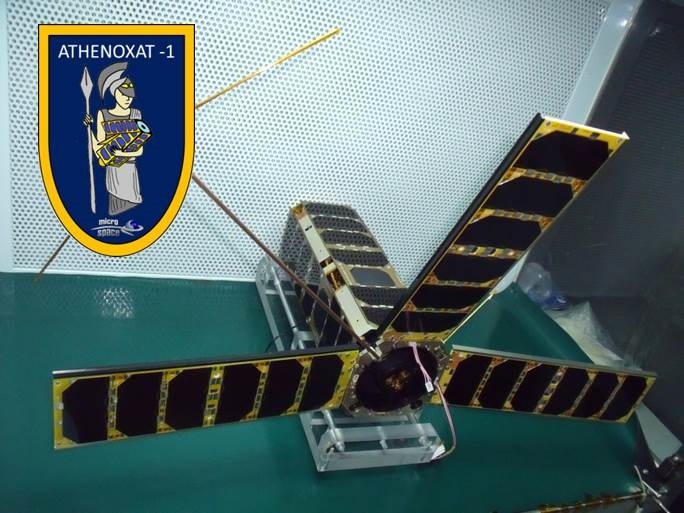 In 2015, Microspace’s second satellite, Athenoxat-1, was part of an all-Singaporean launch of six satellites into the near-equatorial orbit. Athenoxat is actively supported by the amateur radio community in the equatorial belt, who participate in collecting and collating images. SpaceTech Asia spoke to Founder, CEO and CTO Giulio Manzoni about Microspace and its satellites, as well as the future of space technology. Microspace was established in 2002 in Italy, and in 2007 in Singapore. What made you decide to start developing nanosatellites so early on? 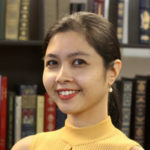 Why did you choose to set up in Singapore? For me, space is a passion that has materialized in creating my company to develop special technologies for satellites miniaturization and complete nanosatellites. This was also functional to achieving my goals without being swamped as a big corporation employee, or in large organizations and universities with bureaucracy. I had to start Microspace to have the necessary freedom to do what I wanted; it was necessary and possible, and a good niche where I could work on top topics undisturbed by market perversions. My goal was to give the smallest satellites the same (or better) performances than the big ones. For this purpose the most urgent thing was to develop an efficient and simple micropropulsion system with finely controllable thrust, in the range of 100 microN to 1mN. I needed micro and nano technologies and I set for that target immediately. I also arranged my own PhD on the same topic while starting the business. Together with other like-minded partners we got our first R&D contract from the European Space Agency within 6 months from the start. In the early 2000s, nanosatellites were a rare topic; we were a small club of a dozen people meeting in Houston once a year at the “Nanospace” conferences. Then ESA started their own bi-annual meetings too, and things started moving a bit. At that time I was discussing Nanosatellites Roadmaps with the ESA officers and, in fact, I drafted the Micropropulsion Roadmap for ESA around 2002. After the first prototypes of Microspace’s micropropulsion devices were made in European laboratories, I joined a research center near Tokyo to do more experimental work and to learn all the tricks by personally making the microthrusters I was designing. I spent a great time in the clean rooms of AIST Sansoken creating the 2nd generation of our supersonic micronozzles. Eventually a customer in Southeast Asia needed a new set of nozzles and the choice for production went to Singapore. I set up my laboratory in a small 10 sqm room while searching for new projects. After a couple of years we could convince our local esteemed clients to demonstrate our technologies on a new satellite, to be made entirely in our laboratory here that then became a bit larger. Please tell us more about your first satellite, POPSAT, and the micropropulsion system you have developed. 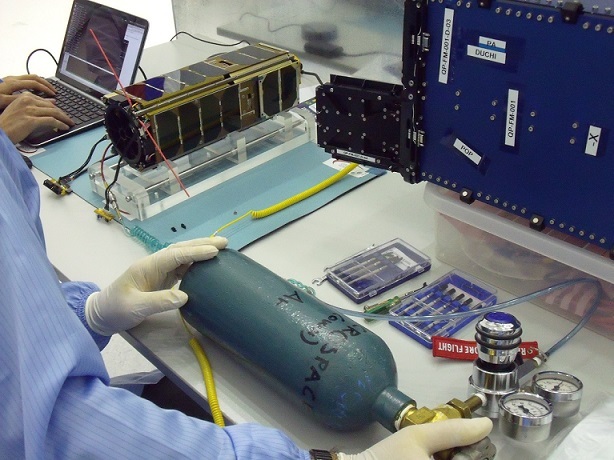 We started developing POPSAT in 2010 and it was launched in June 2014, becoming the first nanosatellite in history launched by a Singaporean team. It has a mass of only 3.3kg and the size format of a 3U Cubesat. It is equipped with a high resolution camera and a micropropulsion system, integrated according to one of our patents. We designed it to demonstrate the functionality of our microthrusters both for Attitude Control and for Formation Flight maneuvering in very low weight architecture; we mounted 8 of our micronozzles in optimized positions on the satellite body. This was possible thanks to the extreme miniaturization of each nozzle unit, which, all included, is much smaller than a matchbox and can be mounted practically anywhere and in any reasonable number even on Cubesats. We went to the Yasni launch base in Russia to prepare it for the launch. We were one of the few teams allowed to be at the base amongst the 33 satellites on board that Dnepr rocket and the only team being there from the over 20 nanosatellites present on that launch. This was necessary because of the very special situation of having to fill the propellant tank of POPSAT just before the launch. Travelling and living for a week in that special place was a unique life experience unique, especially for my two teammates Yesie and James. POPSAT tank-filling. Image courtesy of Microspace. All went well with the launch and the satellite was heard immediately by German radio- amateurs 5 orbits before it would eventually pass over Singapore. After initial checks we started operations of the various systems and particularly of the propulsion which was used almost daily for 9 months for experiments. We had some electrical power struggles mostly due to some bugs in the software and hardware made by a supplier, but we got good help from the radio-amateurs worldwide. We achieved a controlled reset of the satellite by very carefully depleting the batteries thanks to the radio-amateurs’ relayed information on the battery voltage between the passes over Singapore twice a day. POPSAT was our entry experience in developing optical systems for nanosatellites but for its long term propulsion experiments, POPSAT is a first in the world among Cubesats. For us, POPSAT was the coronation of 12 years of work since that first days talking at the conferences in Houston and drafting roadmaps for ESA. Please tell us more about your second satellite, Athenoxat-1. How have Athenoxat’s images been utilized since launch? We designed a totally new optical system, again unique for this class of satellites, in order to achieve the highest possible light sensitivity and resolutions even with the very small volume available on board the 3U Cubesat format. In this case we wanted a much longer mission duration and we also wanted to try making our own reaction wheels for the attitude control, so we did not use thrusters. To operate at night, Athenoxat has a lot more batteries than Popsat and so we designed and built in-house a very special double-sided deployable photovoltaic panels to provide the necessary charge. This required a new kind of deployable antenna which we also made in-house, as with the whole mechanical structure. Athenoxat. Image courtesy of Microspace. Athenoxat was launched from Sriharikota in India on a PSLV specially arranged to launch six equatorial satellites, carrying the Singaporean Flag. We made immediate contact with our little bird and we got nice contact reports from India, Indonesia and South America from the amateur radio community. After 1 day in orbit Athenoxat was already sending the first images from her 5 optical payloads – aside from the night vision system, Athenoxat has also 4 more cameras for day imaging at middle resolution and global viewing contemporaneously snapping in all possible directions, another very unique feature of our little bird. Athenoxat night vision by design gives about 20m resolution and this has been nicely proven during the over 3 years of mission by taking images of Singapore, Thailand, Philippines, Indonesia, India, Brazil, Central America, Central Africa, etc… We also did some very interesting imaging by looking at stars and the Moon, which helped us in the calibration of the pointing system. The other imaging systems have been used to detect forest fires that cause haze, perform 3D images of clouds which can be used for high-precision weather forecast, videos from orbit etc… Night images from Athenoxat are especially important to help maritime security, particularly in the case of ships troubled by pirates, which may switch off their normal radio identification systems (AIS). Other uses can be for studies of urbanization, wealth inequality, traffic, and border control as we are able to see vehicles and city lights at night. Please elaborate on the role of the amateur radio community in helping obtain Athenoxat’s images. Athenoxat has been broadcasting some of her images worldwide in a simple format that can be downloaded by any radio-amateur equipped with a very simple antenna and radio directly to a laptop. We got a nice small community of enthusiastic followers all over the Equator and even in Japan, where Athenoxat can be still heard barely a few degrees over the horizon. Each participant collects pieces of the images and then patches it together to obtain the full picture which, by the way, becomes the first Contact Confirmation Cards (QSL in the jargon) ever sent directly by a satellite from space, another first in the world feature of our little satellites which was also officially acknowledged by amateur radio associations in the UK and Italy! All your satellites are completely developed in-house. Why did you choose to do this, and what are some of the challenges you have faced? From my youth and from my first working experiences it was clear that “Making by Hands from First Principles is the Highest Achievement of an Evolved Mind”, so this has become my life mission. The underlying concept is very simple and applies especially well in the field of aerospace. If we make things in-house they cost less than if we buy them because we avoid the price duplications applied on each step of the sales and distribution chain. But, more importantly, we always learn something new, which is a way to keep the mind alive, and we make our systems exactly the way we want so we can always optimize the satellite architecture to its actual mission. Working on Athenoxat. Image courtesy of Microspace. Making Athenoxat with commercially available optics would have required a satellite at least 4 times bigger and obviously much more expensive, even if looking only at the launch cost. Just to mention a similar example, SpaceX Falcon rockets are built with the same philosophy, that is one of the reasons they are so successful. Of course we still bought things like radios, batteries and microprocessors, which are Components Off The Shelf (COTS) that made possible the popularity and proliferation of Cubesats in general. But with some of our next projects we will eventually produce also most of those parts to further reduce the costs by another factor 10. It was extremely interesting in our two satellites’ development to measure how much could be actually done by the smallest highly-motivated team unspoiled by bureaucracy, administration superstructures, political biases, and all other inefficiencies that come with big teams. So, unsurprisingly, the biggest challenges were, and are, not internal but external, and mostly related to the drag of a human society that is generally unprepared and uninterested in innovation beyond the buzzwords that are used just to populate the advertisements necessary to sell the daily news. What satellites are you planning to launch in the near future? We are preparing a high-speed long-range communication satellite, both RF and Optical, to be used for a private telecommunication network that will operate on Earth and beyond. And we are working on several propulsion systems that are quite radical compared to everything commonly seen until now and they will be used not only for small spacecrafts but also to propel very large bodies up to the sizes of Asteroids. What role do you think nanosatellites will play in the future of space? Can you imagine a caveman carving a raft from a tree trunk 10000 years ago and being asked “what is the future of small floating wood ?”. Could he think about motorboats, dragonboats, buoys, torpedoes, kayaks, catamarans, windsurfs, kitesurfs, messages in the bottles, etc… ? I think what we see today in space is a tiny and almost insignificant fraction of the space activities of the future. People have been complaining about the space exploration speed after the first years that brought us to the Moon or that space tourism did not start yet more than years after Spaceship 1 won the X-Prize. People fail to understand the scale of (space) technology development and are confused by the recent easy progression of fields that require just a laptop and an internet connection. Space will be eventually occupied just as any other region of Earth is. There will be all sorts of objects large and small in orbit and beyond. Of course if we only look at things with the extremely narrow view of financial investors or government officials that measure successful returns in a couple of years at most, there is very little future to talk about. We must look at much longer-term results and that is what I always did, so that I may appear misaligned in the crowds, but that is because I am always at least 10 years ahead working on things that will be normal after I will retire (which is an undefined time target always beyond the event horizon!). Nanosatellites is just a name today that will soon lose its meaning when things in space will be addressed by their function and not by their size. Already today there are dramatic differences between what people call “nanosatellites” as some of them are just beeping devices and others are packing more functions than a Hubble telescope in the same couple of liter volumes. When humans will really populate space, which is going to happen in any case, there will be all sort of very small devices of vital importance up there. That is the future of Nanosatellites. What are some new space technologies that will become very important in the years to come? Autonomous On Board Processes (normally called Artificial Intelligence), Optical Communications, Propellantless Propulsion, Rocketless Launch to Orbit, Radiation Protection for Living Beings, Total Waste Recycling, Long Term Psychological Resilience of Crowded Working Places Without Escape… and we are working at least on two of those. In the long-term, how do you think the space industry can contribute to life on earth? What is your ultimate vision for humanity’s future in space? I come from an age when we navigated roads and cities on a paper map looking at the names of the streets on the edges of the houses, we bought airplane tickets and pizza at the fix-line phone, we called home from the coin-phones on the walls, we could repair car engines with a hairpin… life was decent and nevertheless we hit the Limits to Growth and today somebody still doesn’t believe in the global warming. Progress needs to be taken carefully. Space contribution to life on Earth must be much more than just a spy platform, navigation, TV broadcasting or internet connection. Space will have to become a new production site, transportation path and habitat for humans but not just for the sake of it. It will have to happen if and only if it will be cheaper when all costs and externalities will be considered. Like swimming first and sailing later was cheaper than crawling on the bottom of the oceans (it never happened precisely for that reason)… so space will have a place in mankind’s evolution, but we may have to wait a bit longer than sci-fi writers have dreamt. The risk is that we will have to wait for some catastrophe on Earth to happen before people will be convinced of it. Anyway, to realize such vision we must free ourselves from the slavery of lifting materials to orbit by means of rockets. There are two ways to that goal and they need to be worked out together. We need to collect building materials directly from Space, and asteroids are an obvious answer. And we need to build space elevators and other launcher systems that do not use rockets. As I mentioned earlier, very small spacecrafts will be the work horses of this transformation as they cost a fraction of larger satellites and a tiny fraction of using humans in space for jobs that can be done by robots. Very small spacecrafts will soon have all the autonomous capability needed for the job. Humans will follow and enjoy.